I love olives but the only variety we get are the normal green or black bottled stuff in Mombasa. Wish we could get the huge kalamari type which I go crazy about when I go to UK. If I have been given the task of making a salad at Edgware, half the olives go in my mouth and the rest in the salad. During summer there are occasional market day stalls at Broadwalk and during one visit, I came back home with a full stomach. The stall keepers encourage you to taste everything so you get enticed to buy. Breads, cheese, olives, nuts, sweets, meats etc etc. What a delight. Ofcourse we came back with a whole load of breads, olives and cheeses. Oh well till I visit UK next I will have to do with the olives available in our humble, small supermarkets. 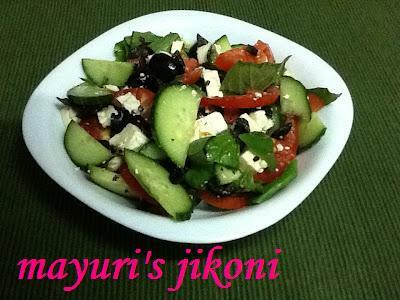 Use olives of your choice for this salad recipe. I prefer using English cucumber but use any variety you like. Leave the skin if it is tender and crunchy. Cut the tomatoes into halves and then cut into thick slices.If using cherry or plum tomatoes, half them. Add it into a bowl along with the cucumber. Tear the basil leaves into half if the leaves are big. Cut the olives into half and add to the bowl. Add the feta cheese and dressing to the salad. Mix gently and serve. If you do not have a small whisk, put the dressing ingredients into a jar and give it a good shake. Add any dressing of your choice. I have not added any vinegar or lemon juice to the dressing as the cheese and olives taste a bit sour. I prefer using Brown ‘s feta cheese in Kenya as the other brands are not really feta. Use mint leaves instead of basil.